As members of the Cyber Security Trend Community are in many instances painfully aware, a host of activities performed in security operations centers (SOCs) remain manual and complex. And, at a time when the number of potential security threats is exploding, including false positives, tying up scarce and valuable human resources with time-consuming and possibly non-productive tasks is something to be avoided. I hate to say at all costs but certainly cost-avoidance with better visibility and performance now more than ever is an SOC priority. The deliverables of the combination are sure to attract SOC administrator interest as they include automated investigation and response workflows, and auto documentation of evidence; while providing alerts, easy collaboration and transparency for IT teams and management that can identify the real threats and reduce response times when bad things happen. As noted the impact on SOC analysts in terms of making their lives easier is the attraction here. Armed with a collaborative interface, analysts can as the name implies chat and more, including such tasks as taking notes, running queries against security products and triggering response actions from an incident’s “war-room” to increase productivity, sharing and learning. In addition, the Demisto Enterprise’s playbook-driven incident management processes help security operations teams respond faster to incidents and be better prepared. The solution is also being promoted based on it providing complete journaling and evidentiary support for forensics information, chats and notes. What is also of note is that the solution is not about replacing people but about freeing them up for more critical aspects of their responsibilities by providing a unique dashboard, along with taking advantage of the security capabilities already in place. 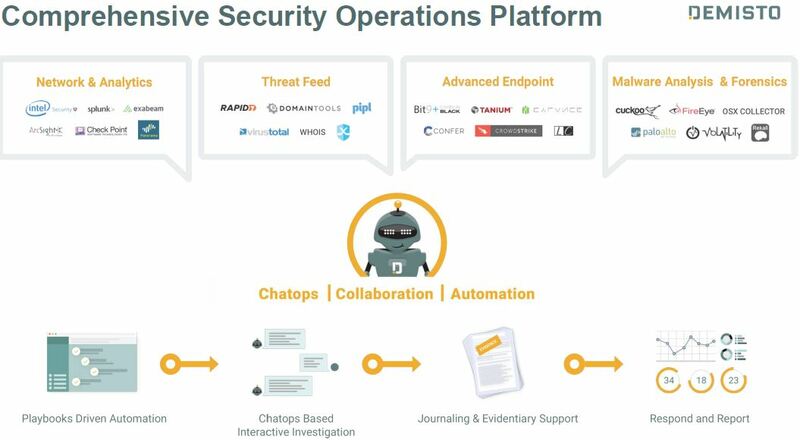 As shown, DBot integrates and can communicate with dozens of products, enabling it to cover the entire security incident lifecycle from creation to close. Pardon the size of the graphic above but as can be seen Demisto Enterprise third party integrations include products across a wide array of categories, including security products, communication products and IT systems. In speaking with Bhargava, he also made an interesting analogy that what the solution is designed to do for SOCs is similar to what SalesForce.com has done for sales and marketing. In other words, take the tedium and errors out of business processes freeing up valuable human resources to concentrate on what they do best. Demisto Enterprise Security Operations Platform already has a community of 370 members and has just received Series A funding from Accel partners. After extensive beta testing it is now available directly from Demisto with pricing calculated based on active platform users. The number of incidents may be increasing exponentially but that does not mean they should serve as an obstacle for SOCs to perform optimally.